Low Cholesterol veg soup recipes, Healthy low cholesterol soups. Easy-to-make, tasty and healthy low cholesterol soups– that’s enough reason to make the recipes from this section. They make use of simple, readily available ingredients, when served piping hot are too delicious to be avoided. They are also a chockful of nutrients including fiber to keep an eye on Cholesterol levels in our body. Carrot is great for the eyes.They relieve constipation, lower blood pressure, have fibre and lower cholesterol. Enjoy this carrot onion soup recipe which uses low fat milk and perfect for low cholesterol. Green peas are good for weight loss, good source of vegetarian protein, has insoluble fibre to relieve constipation. Legumes like green peas, cow peas, mung, chick peas and kidney beans have a cholesterol lowering effect. Enjoy this low cal green peas and mint soup recipe. Nourishing Barley Soup, Spicy Stir-Fry Soup and Broccoli Broth are perfect simple tasty soups. If you have the time to make Vegetable Stock, then do give a try to soups like Tom Yom Soup, Paneer Bean Sprouts and Spring Onion Soup, Minty Vegetable and Oats Soup etc. And if you are looking for wholesome soups like Carrot Soup, Healthy Tomato Soup and Healthy Red Lentil Soup, we have them listed in this section too. These soups are extremely flavoured with fresh veggies, tasty and extremely satisfying without much use of oil, butter or cheese. 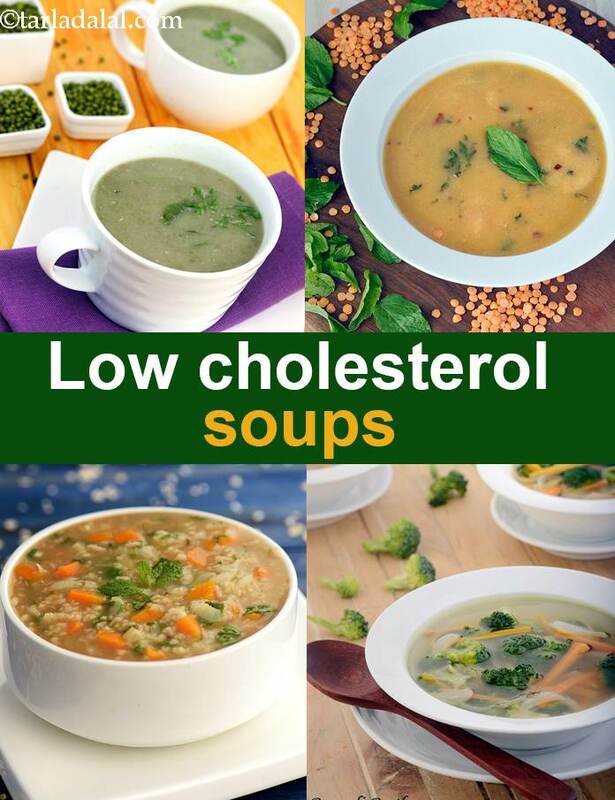 Enjoy our Low Cholesterol veg soup recipes, Healthy low cholesterol soups and other low cholesterol articles below.